Five things to know about the new MBTB iPhone app! You may have seen us babbling on Facebook and Twitter about the Michigan By The Bottle iPhone app and thought we were full of it because it was taking so long. It took us longer than anticipated to provide you with content on EVERY WINERY IN THE STATE, but we're happy to report that it's FINALLY HERE! 1. It's live and available on the iTunes store. Head on over to the iTunes store and download it now for $2.99! 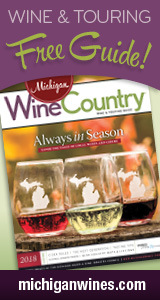 Click on the link, or log into the iTunes store and search for "Michigan By The Bottle" or just "Michigan wine."